With input from both sides, Rory Clarke discovers how the future of the Athletics track in UCD is shaping up. Share the post "Anonymous donor saves the UCD Athletics track from life-support"
The fate of the UCD Athletics track is finally looking up, and with it, the future of athletics in UCD and Ireland as a whole. Although the donation was made public in late January last year, Hayes confirmed that the club was not directly contacted regarding it until April 2018. That same month, they were dispirited upon attending a sports development meeting and “not getting track questions answered”, this “whilst hearing rumours about the track here and there”. Originally costed at €1.6 million, the sizeable donation indicates the angel donor’s desire to not only physically build the track to IAAF competition standards, but to protect and maintain it in years to come. Speaking in UCD Connections (a UCD alumni magazine), O’Keefe branded it a “legacy project [which is] critical to the new master plan.” This far-seeing approach also reflects the ethos behind the original track. It was opened in 1977, as the first of its kind in Ireland, and survived until the fateful closure in 2011, with the cited health and safety concerns scoffed at by many, who felt that the track was merely suffering from “wear and tear” and was wanting only in investment. According to both Hayes and UCD Student Services planning permission has been lodged (ahead of schedule), and is currently awaiting approval. 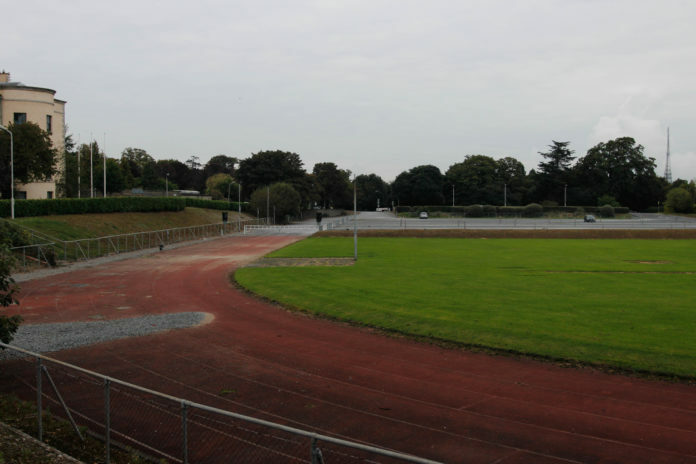 After some doubt over its new location, due to UCD’s development of a new master plan for Sport and Recreation, Hayes adds that the track is “to be located in Richview carpark,”with O’Keefe hopeful that the first earth will be turned in early spring. The University is “confident” that the track will be completed for summer 2020. The new track has been a long, and doubt-ridden time in the coming. However, there is one thing for certain: with such a generous donation, and with athletes determined to see the project through, it will be a long time in the giving back. It will be a long time in helping UCD and Irish athletics reach new heights.